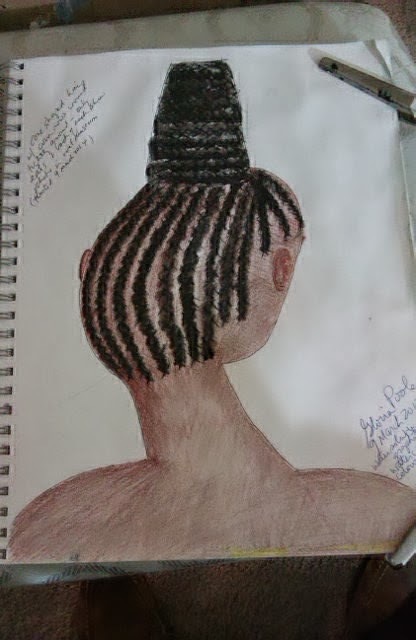 I tweeted the first sketch a few days ago, as I drew it from a photo the Met Museum in NY tweeted. It is not identical to their photo since their photo was black and white only. But I thought the hairstyle was intriguing. I would guess it is most likely a housewife of Africa. The second sketch is an Ansara dancer similar to the costume I saw in the news. They are paid entertainers and they dance in public festivals and events. So, the 2nd sketch is a dancer. 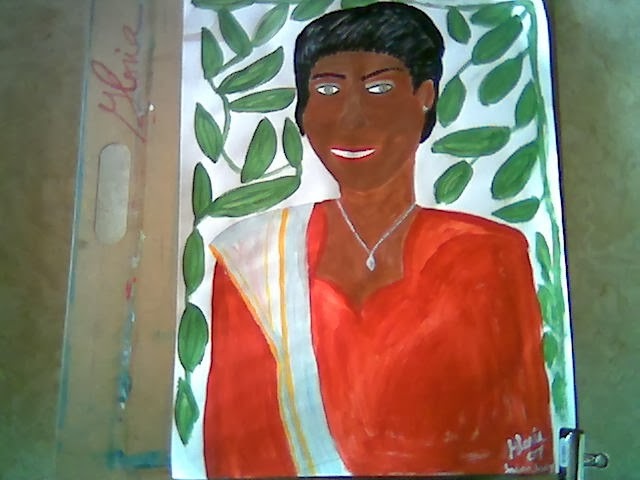 The third sketch is a gentle woman from Andra Pradesh, India. An owner of a business in a formalized "portrait". The next sketch is the only one that is of a living person, known worldwide. 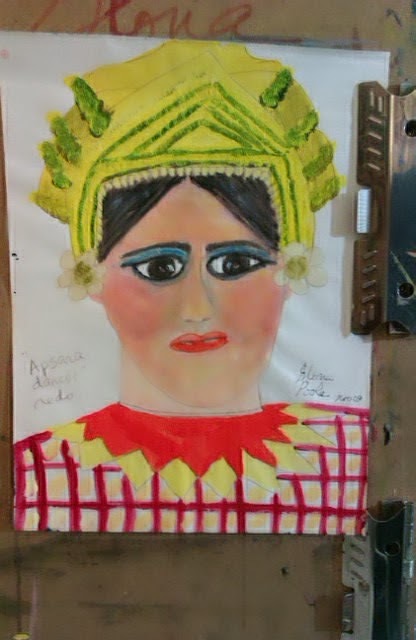 It is intended to resemble Mrs Rouseff of Brazil who is their current President, and who has decided that Brazil will not kowtow to Obama. She obviously is the most powerful woman of this group. 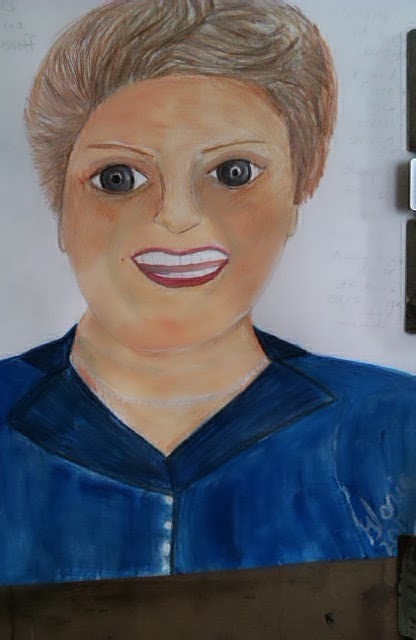 "Brazilian Pres Rouseff" sketch by Gloria Poole of Missouri; year 2013. This sketch is the only one of this batch that is of a real person. 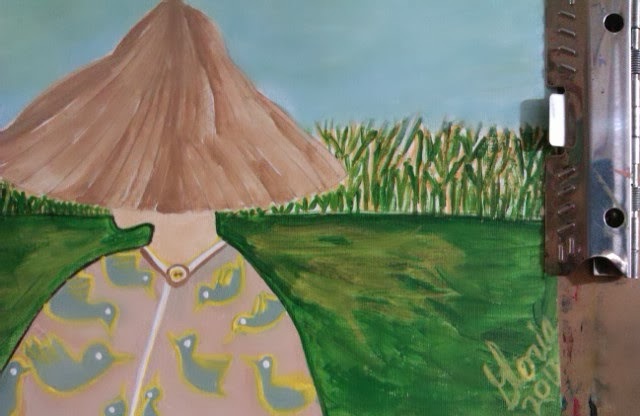 The fifth sketch is a Beijing farmer, growing corn. I consider farmers to be some of the most important people on the planet because they feed the world. The last sketch in this batch I named "Brown Lady" because of her turban-hat and skin color. I did not know her profession, just admired the way she tied a scarf into a hat. And drew and painted a sketch of it. The hat resembles a real person's but I changed the face. 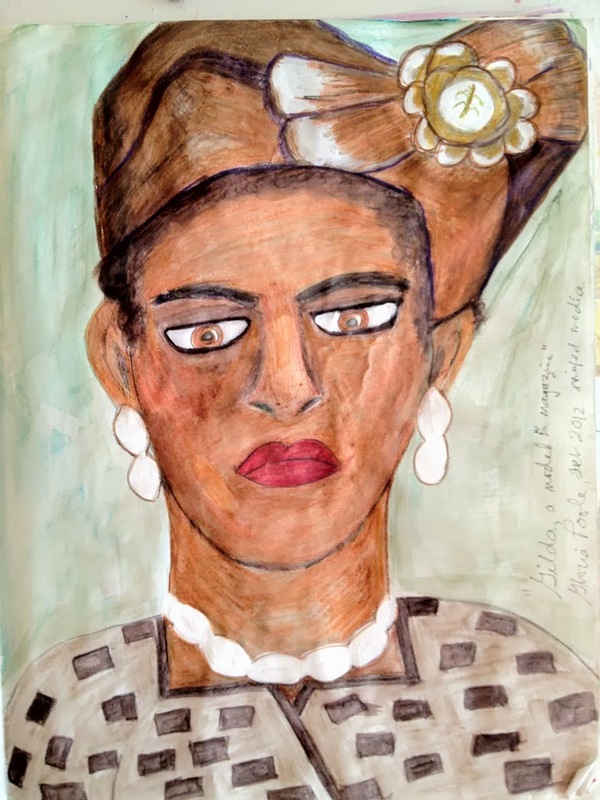 "Brown lady" sketch by Gloria Poole of Missouri. I, Gloria Poole, of Missouri and Georgia, am making this post about international women and their roles in life. I drew, painted, signed and named these sketches and that is true of all on this blog. This selection is about women because I am a woman and women are always in the news as if the male race didn't matter much on the issues of human life. There was an "International Women's week" recently and it was in the news, so this is my contribution to the cause of recognizing women around the world. Copyright Notice: I, Gloria Poole, currently residing in Missouri but born in state of Georgia, own all rights to this blog and to the content of it. I also own all rights to the art I create in any place, with any tool or method, for any reason, at any time, whether or not I photograph it and whether or not I display it publicly anywhere. That is also true of the words I write and the photos I shoot. I sign my art as Gloria which is my given at birth first name and also on some sketches as Gloria Poole which is also my given at birth name. On the web I am also known as : gloriapoole; gloria.poole; gloria-poole; gloria_poole; gloriapoole1749; gloria0817; gpoole817; Poole, Gloria; Ms. Gloria Poole; artist-gloriapoole; gloriapoole-paintings; and other variations of my real name of Gloria Poole. For the record, I am a white, single again [divorced twice] woman, christian, and the natural mother of two grown daughters who are also white and grown and married. I am prolife, republican, and a Registered Nurse licensed in Missouri. Also, I have other blogs. For a list of those see https://gloripoole.blogpot.com . Gloria Poole; at my apt in Missouri which is my only residence; 12-March-2014 at 7:10pm.